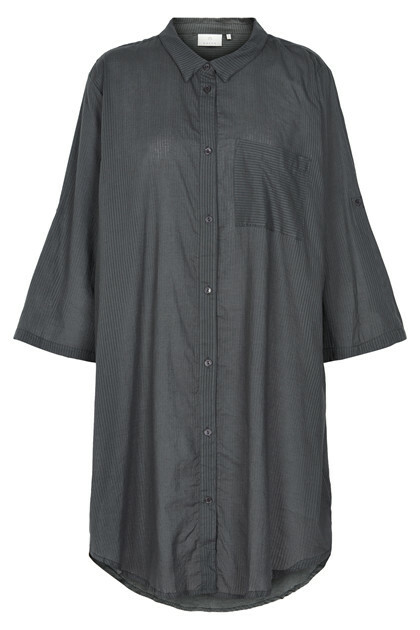 Trendy and classic long shirt dress from KAFFE. This beauty of a dress is 100% cotton quality and therefore very comfortable to wear. It has a length above the knee as well as is made in fashionable colours. Furthermore, it has a regular fit, has ¾ sleeve and is buttoned – and therefore is it possible to use it as a dress, but also as a kimono or long open shirt. It is definitely a must-have for your wardrobe and is perfect for both everyday use and festive occasions.